Right-wing media figures are attacking President Obama for claiming that extending unemployment benefits and the payroll tax cut will create more jobs than the Keystone XL pipeline. In fact, economists say that unemployment benefits and payroll tax cuts will put money in people's pockets and therefore lead to job creation and economic growth, while the pipeline would create at most a few thousand temporary jobs and could actually destroy more jobs than it creates. OBAMA: Keep in mind, on the payroll tax cut, this is something that Democrats and Republicans agreed to last year with little fanfare, and it was good for the economy. And independent economists estimate that for us to not extend it right now -- to not extend payroll tax cut, not extend unemployment insurance -- would have a significant, adverse impact on our economy, right at a time when we're supposed to be growing the economy. So when I hear the Speaker or the Senate Republican leader wanting to dicker, wanting to see what can they extract from us in order to get this done, my response to them is, just do the right thing: Focus on the American people, focus on the economy right now. How Pelosi-esque. Our Doofus in Chief believes handing out unemployment benefits creates more jobs than building a gas pipeline. DANA PERINO (co-host): I think though that the Republicans were pretty smart in tying the payroll tax cut to the pipeline, and the reason is the pipeline would be 20 thousand jobs plus others for that middle-class blue collar worker, much more beneficial than a temporary payroll tax cut of which the American Enterprise Institute Alex Brill says only 22 percent of people actually spend that money. PERINO: Can we hear the sound bite? Can we hear the sound bite? Because a lot of people do know about the pipeline, and we're going to make sure even more of them do now. OBAMA [video clip]: Here's what I know. However many jobs might be generated by a Keystone pipeline, they're going to be a lot fewer than the jobs that are created by extending the payroll tax cut and extending unemployment insurance. PERINO: So for the next year, who benefits from a delay in the payroll -- in the XL pipeline? It is white collar lawyers, PR folks, the communicators, and the bureaucrats. It doesn't help the middle class workers that he said he wanted to help the other day. BOB BECKEL (co-host): Of course it does. While it would cost an estimated $45 billion to continue the extensions, the economic boost would be much greater because this spending would have a large "multiplier" effect. Long-term unemployed workers are almost by definition cash-strapped and have very little choice but to immediately spend their unemployment benefits. Unemployment benefits spent on rent, groceries, and other necessities increase economic activity, and that increased economic activity saves and creates jobs throughout the economy. For this reason, economists, including those at the Congressional Budget Office, widely recognize government spending on unemployment insurance benefits as one of the most effective things that can be done in a recession to generate jobs. Spending $45 billion on unemployment insurance extensions in 2012 would increase GDP by an estimated $72 billion, raising our $15.2 trillion GDP by roughly 0.5 percent. This increase in economic activity translates into roughly 560,000 payroll jobs. In other words, extending the federally funded unemployment insurance extensions through 2012 would not only extend a lifeline to the families of millions of long-term unemployed workers, it would also generate spending that supports well over half a million jobs. If this program is discontinued, the economy will lose these jobs. 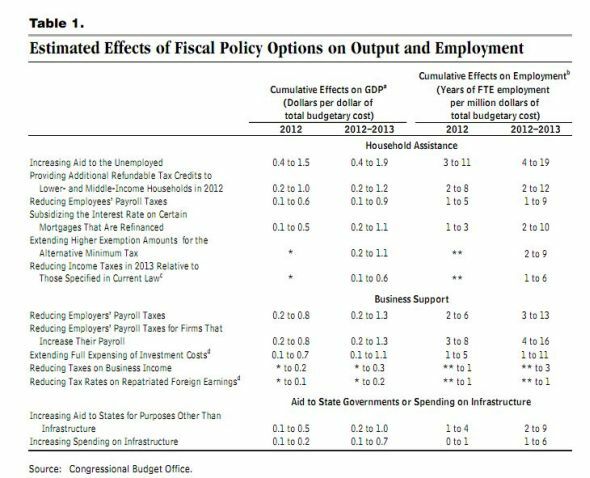 According to a table in the report, the CBO estimated that increasing aid to the unemployed would have the greatest effect on GDP per dollar of budgetary cost and the highest cumulative effect on employment of the policy options considered. If the economy could generate jobs at the median wage for even half of these people, national income would grow by more than 10 times the total interest cost of the 2011 deficit (which was less than $40 billion). So anyone who says that reducing the deficit is more urgent than reducing unemployment is saying, in effect, that we should burn hundreds of billions of dollars worth of goods and services in a national bonfire. We ought to be tackling both problems at once. But in today's fractious political climate, many promising dual-purpose remedies -- like infrastructure investments that would generate large and rapid returns -- are called unthinkable, in the false belief that they would impoverish our grandchildren. Yet there are other ways to attack unemployment that could garner bipartisan support. To boost private sector spending and jobs, any budget deal negotiated by the president and Congress should contain an immediate suspension of the entire employee payroll tax through 2012. Why? Because leaving more money in people's paychecks will cause them to spend more, and in response to their spending, private sector employers will expand production and create private sector jobs. Without this stimulus to the private sector, the economy is likely to fall back into a deep recession. The labor market is suffering from two problems: first, an immediate jobs gap, primarily the result of the collapse in demand after the 2008 financial crisis, and second, a long-term gap in rewarding jobs for American workers, primarily the result of skill-biased technological change and global competition. Failure by Congress to extend the temporary payroll tax cut enacted last December would reduce all paychecks starting on January 1, withdrawing needed support from the still-weak economy. The measure, part of the tax cut-unemployment insurance deal between President Obama and Republican leaders, reduces the employee share of the Social Security payroll tax, boosting workers' take-home pay by an estimated $120 billion in 2011. The tax cut is worth $934 to the average worker. A much better option is for the administration to reduce the payroll tax for two years. The reduced labor costs would lead employers to hire more; for employees, the increased take-home pay would boost much-needed economic consumption and advance the still-crucial process of deleveraging households (paying down credit card debt and other legacies of the easy-credit years). "If you give a temporary tax cut to wealthy people who are likely to be highly liquid, they are not going to spend very much of it at all," Krugam [sic] said. "Give a temporary tax cut to corporations, who are sitting on piles of cash, they are not going to spend any of it." But here's an idea that might command everyone's support: Eliminate payroll taxes on the first $20,000 of income. Payroll taxes, you recall, include Social Security, Medicare and unemployment insurance. Make up the revenue loss by applying the payroll tax to incomes above $250,000. This would immediately stimulate spending by adding to the paychecks of just about every working American. Right now, 80 percent of Americans pay more in payroll taxes than they do in income taxes. And lower-income workers, who would receive the largest proportion of the benefits, are more likely to spend the extra cash than are people with high incomes. So how to get the economy moving again? Eliminate the payroll tax on the first $20,000 of income and apply it to income over $250,000 for two years. Given our feeble labor market, it is particularly important that policy makers avoid overly hasty deficit reduction. Official projections for the federal budget show fiscal tightening in excess of 2 percent of GDP from fiscal year 2011 to 2012. To put that percentage in context, consider that the fiscal tightening in the U.K. from 2010 to 2011 -- which has received so much attention in the news media -- amounted to less than 1.5 percent of GDP. The industry-generated jobs data are highly questionable and ultimately misleading. But this is only part of the problem. These industry-generated data attempt only to tell the positive side of the KXL jobs story. There is evidence to suggest that the effects of KXL construction could very well lead to more jobs being lost than are created. In this section, we show four ways that jobs can be destroyed or prevented by KXL -- higher petroleum prices, environmental damage such as spills, the impact of emissions on health and climate instability, and the chilling effect KXL approval could have on the emerging green economy. For more information about Keystone XL pipeline's potential impact on job creation, click here.